Broadside grows daily, now with 21,185 followers worldwide, an audience I really appreciate — and we have great, civil conversations in the comments! I’m Caitlin Kelly, a National Magazine Award winner, a writer and speaker whose career includes work as a reporter and feature writer for three major daily newspapers. I’ve also produced 50+ freelance stories for The New York Times; here’s one of them, third-most-emailed of that day’s paper. Please follow me on Twitter and Instagram at @CaitlinKellyNYC. Everything on this site is copyright; links are fine, anything else requires my explicit permission! I offer 90-minute, one-on-one webinars, (offered in person, here in New York, by phone or Skype), to help fellow writers and bloggers improve their skills; details here. I also coach individually by phone, email or Skype, with many satisfied clients from Australia, New Zealand, Canada, the U.S. and Europe. Lots of testimonials on my site from happy clients! Please email me at learntowritebetter@gmail.com; $250/hour with a one-hour minimum. Six of my posts have been Freshly Pressed; here’s the most recent, about why we need to say thank you. I’ve published two books of detailed national reporting on complex issues, on American women and gun use, and retail work; for the first, I interviewed 104 men, women and teens from 29 states. My newest book, a memoir, is about working in an upscale suburban mall for The North Face. It’s an honest and highly-detailed look into the nation’s third largest industry. You can read a sample of it here, and buy it here. Of course, it’s also available as an e-book. It’s also been featured in Marie-Claire, USA Today, People, Time.com, Fortune.com and Forbes.com, and many others. 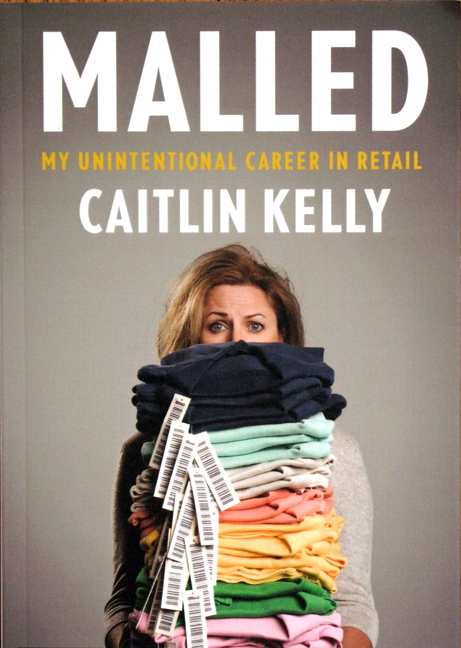 “Kelly’s powerful descriptions of retail…highlight so much of what is wrong with our economy” said David Madland, Director of the American Worker Project at the Center for American Progress. Here’s my essay on the Harvard Business Review blog about the overlooked value of retail associates. I’ve keynoted and addressed major retail conferences, including Retail Customer Experience, whose audience members included senior executives from Swarovski, Cabela’s, Target and Old Navy. A lively speaker, I’ve got practical, useful tips for retail managers to help them hire, manage and motivate. Here’s a link to my most recent address, to students and retailers at the University of Minnesota. Thanks much….There should be a link on the site where you sign up to subscribe. I’ve never done it….Or add me to your RSS feed..? Fascinating. Is there no sign up? Hello and thanks for posting 10 ways to seriously improve your writing! We share many interests including my intense desire to continuously hone my writing skills. Thanks for that added push and inspiration. Amazing…..You are great. I’ve added your blog to my blog roll. I’ve just come across your blog for the first time. I love that you are a generalist. I’ve always seen myself as a “Jill-of-all-Trades” and wondered if it would be better to be more “specialized”. Looks like I no longer have to wonder and can relish being a generalist. I’m signing up to receive emails of your new posts. I won’t say it’s easy! I think specialists can make more income but I have so many interests that I get bored easily. I really love being able to switch between design or business or sports to news or an essay. The game many of us play is to have several specialties (business is very much one of mine). Hello! I’ve actually met a real life journalist now, so, wow! “Malled” sounds interesting. I love reading about different jobs. I just subscribed to your blog 🙂 thank you for your lovely comment on my most recent post! Looking forward to reading “Malled”!! Thanks! I think you’ll enjoy it. Please let me know. Can’t wait to read Malled! That will be my holiday gift to myself. Thanks! What a fascinating career! I, too, like that you are able to write about your different interests–sounds like more fun than a specialized focus, but that’s just me. Thanks for visiting my blog! Glad I found yours! Thanks. If you like it, please tell everyone you know! The book is getting a lot of press attention, but sales are the measure of its success. Interesting to read about your writing journey. I have a very old degree in journalism (graduated when I was 22, I’m 50 this year, so you can imagine how useful that is at this point in time!) I have never used writing to make a living, although some of my jobs have required writing skills. But I couldn’t, in any sense of the word, say that I have worked as a journalist. I find the path that brings people to blogging interesting, the diversity of the journey and the variety of people you run across. Hey Caitlin! Awesome insights…..I love your wit! Looking on amazon right now and Im pretty one of your books is going to be my next indulgence! Thank you! Thanks! Good to have another Aussie subscriber…It’s so cool to have readers so far away who enjoy the blog. Thank you for your sweet comments today! Your encouragement means a lot to me, and I appreciate your words as a fellow creator! 🙂 I look forward to reading your blog! Better read through the library than not read at all! If you *do* like it, please post a nice review at amazon.com? That’s as good as a sale to me. Thank you so much for all your interesting posts, I really enjoy your blog. I’ve nominated you for a Versatile Blogger award here http://bombaypink.wordpress.com/. All the best for the holidays, and again, thanks. Thanks! I’m delighted you’re enjoying it….Thanks, also, for the VB award. I’m a little crazed to do the 15 bloggers/letting them know it right now, but hopefully in January. Thanks for leaving a comment on my “A Year in the North Cape”… because now I’ve found your blog and I’m following it now. Congratulations on your new book. Looking forward to reading your posts and I wish you all the best with your latest book publication. Thanks! Your life sounds so interesting. Glad you’ve come to visit Broadside. Thank you for your comments on the artists on my blog. I look forward to reading your advice and experiences in the publishing industry! Thanks. I don’t write about it that often, but from time to time. Feel free to check out the archives, where you’ll find a lot more on this. I’d be very interested to see how you react to Malled since you know the territory so well. I’ve gotten a lot of emails from retail veterans who think it’s extremely accurate in its reflection of life behind the cash wrap. I’ll let you know. 🙂 Unfortunately, the retail worker faces abuse from both management and the customer, so it’s basically a double-edged sword. I’m definitely curious on your take. So true. I’ve been lucky enough to be paid to speak to three audiences (so far) of retailers — and I remind them all that their front-line staff are extremely vulnerable to abuse. Thanks for the comment! It’s tough, but knowing other people out there have gone through/are going through the same thing eases the pain. Your book looks like it will be very interesting! I work in an upscale mall right now, and there is a lot of behind the scenes action that people never know about unless they work retail. Namely, how hard it is to come face to face with people that instinctively hate you the moment they see you (you’re the bad guy who will tell them they can’t use that coupon) and that awesome moment when a customer treats you like another human being. I look forward to more of your blog in the meantime! Thanks! I think you’ll find a lot in the book to relate to. It was really shocking to me how rude shoppers can be, for no reason at all. I appreciate the thoughtful comments you have left on my blog. It feels good to be able to engage in a conversation with you and the rest of those who are on wordpress. I know I’ll be adding your books in my to-read list, seeing how interesting they are. Thanks. Hope you enjoy what you read here. Having just spent an hour devouring your blog posts, I was moved to comment! Your pieces are delightfully well written – interwoven with inspiration, smarts and your unique flavor. I look forward to reading more. I just read your 10 objects post and now this. Your book sounds brilliant. I fully intend to go out and find it. I’m a fiction and creative nonfiction writer trying desperately to get an agent at the moment, and I’ve just clicked the “follow” button not with the vague interest that usually leads my mouse there, but with a full desire to be a “follower”, however scary WordPress and Twitter make that term sound. Can I ask what your opinion is on MFA courses? I’m thinking about applying, but finding it hard to get a straight answer about how useful they are. You may want my life, but I seriously doubt you want the daily hustle to achieve it, or the income that comes with it. It looks probably quite different from the outside. I enjoy it, but it should be easier by now! The publishing world is in turmoil, as is journalism. I made my easiest and best money last year on speaking engagements related to my book. Gotta love the irony — folding T-shirts for 2 yrs in a mall and writing about it has ultimately paid off. Glad you’ve signed up. Please comment lots…we have a great group here. I don’t tweet, so it’s here, my websites and malledthebook’s FB page. I never took an MFA and probably never would, for lots of reasons — none of which may apply to your goals. 1) I dislike formal education; 2) I couldn’t imagine paying $$$$$ to write a book; 3) the opportunity cost seems too high to me. BUT…I also spent years writing for national outlets and worked for 3 newspapers so I basically got paid to learn to write…and that’s the (putative) value of an MFA. One friend of mine has one, but none of their novels (yet) have sold. Thanks, that is really helpful. I’m looking at MFAs specifically because some of them have full funding, whereas if I stayed in the UK the same would cost a fortune. So I think my thinking now is do it as long as it’s free, but otherwise work out a way to do the same myself. There is some beautiful irony in your least interesting job becoming ultimately your best paid. I’m glad it worked out like that for you. And I look forward to reading more on this blog. So glad I found you! I’d be really thoughtful about an MFA. What (rhetorical question) do you want to get out of it? Contacts in the publishing world (there are other ways to get them.) An agent (ditto.) Street cred. Or do you want to teach? There are many valid uses for an MFA but I would not ever assume it will lead to the publication on your work as a result, and I think that is exactly the hook they use. I’m looking mainly for experience teaching and a way to “hone my craft”, as pretentious as that sounds. I’m already in talks with an agent and I’ve had a bit of interest from others, but I’ve never formally studied writing and I often feel like I’m faking it. I think some of what I write is kind of okay, but I struggle with other bits, so I hope I could benefit from tuition and from being in a writing community. Plus, I’d like to learn a way to make a living from writing (read: I’d like to quit my coffee shop job! ), hence the teaching experience would be useful. What I’m not sure at this stage, though, is how transferable an American MFA will be back in the UK. Sorry, you didn’t really need my life story! Thank you for taking the time to answer my question, it’s really helpful to get an opinion. Thanks for stopping by my blog earlier today, Caitlin. I look forward to reading more of yours. I really enjoyed “Malled”. Having worked so many types of jobs in my 59 years on this planet, it’s amazing that I never worked in retail. I’m glad I got to do so vicariously! Now that I’ve moved back up north and am in the process of looking for work, I am game for any sustainable employment where, to paraphrase a quote from your book, I can keep “fun” in my “functioning”. Thanks! Retail — if you find the right team — can be a lot of fun. I really enjoyed it for a while. 2.	http://notquiteold.wordpress.com –Another lady with solid writing skills who brightens my day. I learn a lot by reading her blogs. It’s hard for me to write a female POV, and she is SO feminine—it helps me get a handle on how to do this, or at least how to attempt it. 3.	https://broadsideblog.wordpress.com –Amazing. Thought provoking. The lady is a pro, and though I suspect she has a gazillion followers, I had to put her on my list of favorites. Her last piece—Etan Patz—brought tears to my eyes. I appreciate the award. I haven’t got one spare second for the next few weeks. If I can find time away from paid work, I’ll respond. No worries on the reply. I just had time on my hands. Have fun. Hello Caitlin, you probably have gotten thousands of these and you are more than welcomed to ignore it, but wanted to let you know that I nominated you for the Illuminating Blogger Award. (http://nilaewhite.wordpress.com/2012/06/03/absence-and-awards/) Cheers and thanks for all your great posts. Thanks. Nice to be appreciated! I’m appreciative of the VB award but haven’t been able to carve out the time to do the nominations, etc. involved. I do appreciate the compliment though! No worries! Just wanted you to know! I’m not the kind of gal to say, “Send out your nominations in the next 24 hours or you will have seven years of bad luck.” 🙂 It’s really just an appreciation thing. Wow– I’m totally intrigued. After braving six years in fashion retail, I often talk about how retail associates are vastly underestimated. Can’t wait to check out your essay and your book! Yay you! It is so rare to hear any sort of appreciation for our skills. I hope you like Malled…much of it will be very familiar to you. So this other blogger, Ms. Know-it-All Sweet Mother is like: “Hey Le Clown, do you know Broadside? You should follow her, you’d like her”. So here I am, and I should like you, says SM. No pressure, right? Pas de tout, mon cher. Bienvenue! Merci, et au plaisir de te lire davantage. Your blog is worth sharing, so I’ve nominated you for a Beautiful Blogger award. Keep up the great work! Do you have the “reblog” function turned off? I don’t see a tab for that with this theme…I believe (?) others have re-blogged my stuff before…. yes theres nothing quite like working retail.. i worked for one of the leading “music and entertainment” retailers on the high st in england. prob the worst job i ever had. they really took the piss with what they expected to the point that i now refuse to shop there. they’ll be out of business soon tho so thats good. I also agree with your points about women whining about their size. females are bred to be concerned about little else nowadays. the few that do dare to think and voice opinions get shot down pretty quick. Retail is pretty consistently brutal no matter where you work — the only place I’ve heard of that pays decently, and only because of government regulation, is Australia, where the minimum wage is very high indeed compared to other nations. Hi Caitlin, I was wondering if you would consider writing a post reaffirming the importance of fact-checking in the social media age? I love your writing and would be interested in your comments as a journalist. I ask because with this terrible tragedy that occurred in Newtown, CT, and with the killer having been mis-identified at first by various media outlets (although I understand it was a police officer who made the inadvertent mistake), I can’t help but think the race to be first with breaking news in social media can really damage the integrity of journalism. (Or maybe you’ve already written about this topic; sorry if you have!). You can just e-mail me back directly at vicky.hum@rogers.com if you want. Thanks. I’m flattered you want to hear my thoughts — and I have a post on “page view journalism” already in the can. Maybe I’ll post it sooner than planned. My feelings about this shooting are very complex. I am, as I always am in this moments, angry at the emotionalism and simplistic reporting. Which I will weigh in on, maybe in a day or two. I am very interested in the report that the guns belonged to his mother. Why is a small town elementary school teacher owning two Glock 9mms?! It IS insane. I look forward to hearing some thoughts on your blog. I am a bit of a journalism geek (but am so far from being a journalist), so I’m always interested in hearing the journalist’s POV on major news events such as these! Thanks! I re-read my unpublished post and it’s not very interesting. I probably will blog about Newtown but not right away. PaulaB of TenemosJournal spoke highly of you and your blog. Thank you for stopping by ridingbitchblog as well. I am looking forward to reading your work. Hi there. My name is Jordan Faust, and I’m 23 years old. I studied English (writing concentration) at Colorado State University. My ultimate goal is to become a writer. I’m still not sure what I want to write about, but I’d like some advice regarding how to get my name out there, and how to get my skills acknowledged and more advanced. I could email you maybe, but it seems that you’ve got it together. I’ve also taken some journalism courses, but I love analyzing literature and making arguments with valid points/counterpoints. Do I need to find an internship? Should I work at a book store? I just simply don’t know where to get started. I’d appreciate some advice, even if it’s just simple little things. Take as many writing classes as possible with the toughest teachers you can find. Mediabistro.com offers online courses. Working at a bookstore is not going to help you one bit. If you can get to this conference — which offers student rates — try to do so. Or buy some some CDs of the panels; it’s in NYC April 26 and 27th. By the way, I’ve worked at Old Navy, a retail store for almost 6 years now. Maybe I could write about that? If you’ve something to say about it that hasn’t been said, sure. Thank you so much making such a wonderful blog ! Awesome learning here and hope to visit more often and interact with you. I’ve just watched the available part of your speech to University of Minnesota – what an interesting speaker and amazing person you are. Your book is in the mail and I just can’t wait to read it. Because I so need to be grounded right now – as I am not focused enough to do as well as I could in my writing career – I had been thinking of getting a part time job with NB liquor since I thought selling wine would be quite a cultural experience. Now I know how it makes sense and will follow your steps with my resume which I wasn’t quite sure how to handle. Thank you for sharing the speech! I am very grateful! Selling wine could be awesome! I’d love that…so much to learn. I like that idea. Let me know how it turns out. I am so pleased to have found your website. In fact its been a long time since I’ve done any kind of writing with a deadline and clear purpose.Thanks so much. I Wish you a good luck for every step your take for your success.. But glad that you like the blog! Oh, I’m sorry. I saw U of M and maybe misunderstood that you lived here. I spoke there, as a guest. I attended the University of Toronto. Thanks for visiting (my blog) and stopping to chat. That is if asynchronous posts amount to a chat? Well I have coffee and I enjoyed the exchange of ideas. In my books that’s a chat – thank you. Wow! Speaking of resumes, yours is VERY impressive! A compliment from you is quite flattering. I am enjoying all of the advice on your blog as well. Thanks…Hope you’ll sign up for one of my writing classes! I just need to say, Caitlin, thank you so much for posting your thoughts, viewpoints and experiences, and questions here. I appreciate your skills as a writer but more, I am enriched by your tellings. Thank you for such kind words! One never knows what — if any — value they offer. Hi Caitlin, I’m 58, no grandkids, and look up anytime I hear a plane. I poke my husband of 37 years and say….Da plane, da plane (in my mind it’s the voice of Tattoo from that long ago TV series Fantasy Island). Jose and I borrowed a friend’s house on Fire Island — right where all the planes approach JFK airport — and spent most of the day with our binoculars plane-spotting. Heaven. Hi Kaitlin! I started reading Malled last night and wanted to let you know how much I am loving it!! Not surprisingly, your writing is superb. I have done my time in retail, including management, and so I can absolutely relate to your descriptions and observations. So excited to continue reading! Hey there Caitlin! Just stopped by randomly and thought I’d give you a follow. If you would like to do the same, please come visit me at http://www.thatssojacob.wordpress.com. Happy new year! Thanks, Jacob. Happy New Year! I truly enjoyed reading this! Great page Caitlin. You are very talented and successful. Nice photo.